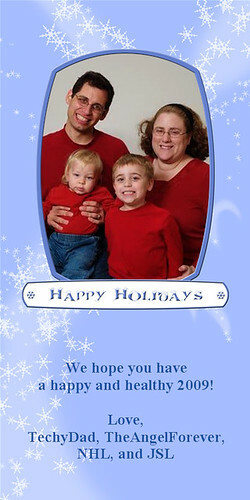 Unfortunately, TechyDad and I are not able to send out holiday cards to everyone that we would want to. Thanks to that, we revamped our cards for our blogs to wish all of our readers a happy and healthy holiday season and New Year. From our family to yours, we wish you only the best in the upcoming year. What a beautiful card!! Happy holidays to you too Beth! Great card! It’s always such a trick to get everyone looking at the camera and not blinking, at the same time. Have a wonderful Christmas! Oh! How cute! How clever! How sweet! What a great card! Happy Holidays!